Good morning. I must say that Mondays are rarely as bright and promising as today. It is my great honour to extend our warmest welcome to the Prime Minister of the Netherlands to this Asia's world city. My warmest congratulations also go to the Netherlands Consulate General on the opening of the beautiful and impressive new office here today. 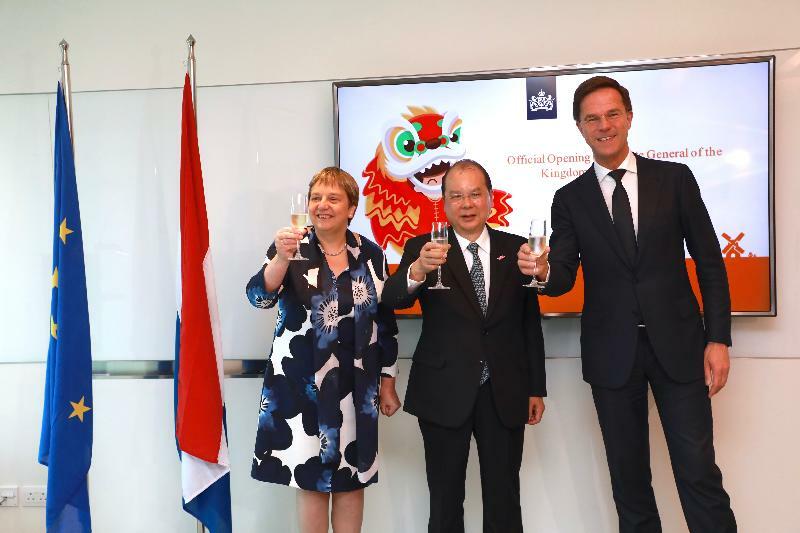 This is the first time for Hong Kong to receive the Prime Minister of the Netherlands, signifying that the close ties between Hong Kong and the Netherlands are growing from strength to strength. Our trade relationship dates back to the 17th century when trade between the Netherlands and southern China, including Hong Kong, boomed. Today, the Netherlands is Hong Kong's third largest trading partner in the European Union, while Hong Kong is the Netherlands' fifth largest trading partner in Asia. The Netherlands has a notable presence in finance, trade, transportation, wholesaling and retailing as well as other sectors including technology, innovation and design in Hong Kong. Currently, there are over 200 Dutch firms in Hong Kong, including the famous brand names of ABN AMRO, KLM Royal Dutch Airlines, Philips, Shell, Heineken and much more. I have no doubt that our bilateral relations will continue to develop and thrive in the years ahead. Hong Kong is renowned for its strategic geographical location and connectivity, reaching half of the world's population within five hour's flight time. We are also the most open, international, well-connected, vibrant and important financial metropolis in China, making Hong Kong an ideal gateway for overseas businesses including those from the Netherlands to enter the China market as well as the entire Asia and Asia-Pacific region, which are the world's fastest growing and biggest market. Last year, US$8 billion worth of goods in the total trade between the Netherlands and the Mainland was routed through Hong Kong. That accounted for nearly 8 per cent of the total trade between the Netherlands and our motherland in 2017, demonstrating our growing role in strengthening the links between Hong Kong, the Mainland and a world of business. Our motherland's far-reaching Belt and Road Initiative and the Guangdong-Hong Kong-Macao Bay Area development will certainly create new impetus for our trade, financial, economic and cultural links with our counterparts. Ladies and gentlemen, Hong Kong is destined to play a major role in those two unprecedented mega developments, given our ever-increasing economic integration with the Mainland, our financial and professional expertise, and our unique advantages and attractions under "one country, two systems". We stand ready to join hands with our Dutch business partners to seize the outsized opportunities that the Belt and Road and Bay Area initiatives will offer long into this 21st century. People-to-people connection forms an integral part of the Belt and Road Initiative. The signing ceremony of the Working Holiday agreement between Hong Kong and the Netherlands later this morning will open the doors further for our young people to foster broader, deeper and more frequent cultural, academic and talent exchanges. The agreement also signifies the fusion of the bauhinia and the tulip! 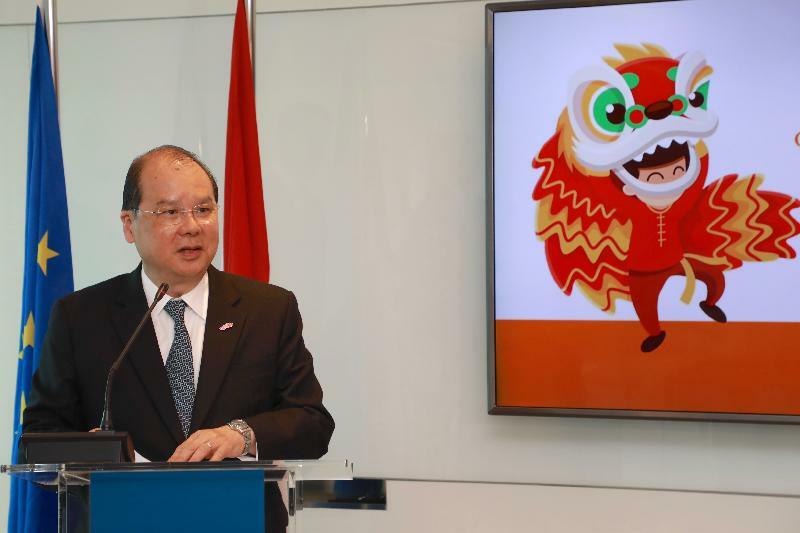 Prime Minister, the fourth month-long Dutch Days in Hong Kong is well under way and will continue right through April under the theme of "Golden Age". It is both a celebration of the long and close relations between the two places, and more importantly, a renewal of the shared commitment to forge a new golden age of collaboration on business, innovation, art and enterprise. I am sure that this year's Dutch Days in Hong Kong will be yet another resounding success. 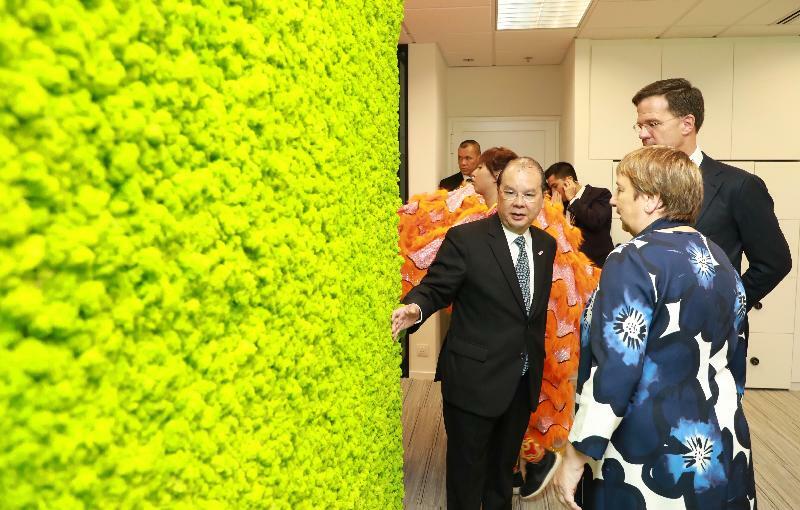 On this happy and encouraging note, I would like to extend my heartfelt congratulations again to the Netherlands Consulate General on the opening of its new office today. I also wish the Prime Minister and our friends from the Netherlands a very happy King's Day and a prosperous year ahead.